Actor Jang Geun-suk, who is gaining wide recognition in the entertainment fields of movies, TV drama and music and has been dubbed one of next-generation stars for 'Hallyu' or Korean Wave, was appointed on Jan. 21 as a 'PR Ambassador' for Seoul City. As the youngest PR Ambassador for Seoul, Jang, who is becoming one of South Korea's best-loved actors in Japan and China for his main role in an SBS drama "You're Beautiful", will promote the city's unique and great charm to the world in the wake of the '2010 Visit Korea Year – With Seoul'. Also, he will play the role of PR Ambassador to improve conditions in the field of culture and welfare for young, talented artists and underprivileged people. In August last year, Jang showed his talent as a PR Ambassador for Seoul by winning an award for his jointly-produced video clip in the UCC (User Created Content) Contest hosted by Seoul City. Jang and his friends won a Silver Award in the contest, titled '2009 Click Your Dream', for college students. Because the number of clicks by anonymous Internet users was a part of the qualification process for an award, Jang used his nickname to hide his real name although he directly participated in the idea gathering, production and editing for the video clip. Later, Jang's low profile for the UCC Contest became known and was spotlighted. The award-winning video clip, titled 'The Object of His Affection', was shown at a meeting between Jang and his Japanese fans, letting them know about Seoul's charm and its tourist destinations. The video also recorded higher views at YouTube after it was posted on the 'Hi Seoul' channel on the video-sharing Web site. 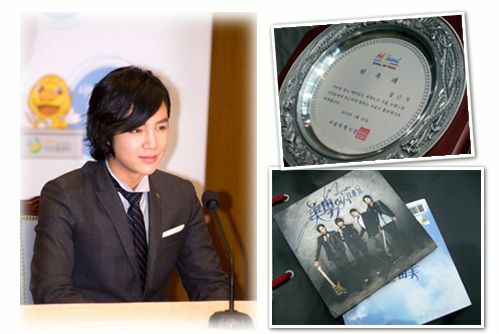 At the appointment ceremony, Jang donated his favorite checked shirt and a soundtrack album of the SBS drama "You're Beautiful". "Whenever I travel, I drive my car over the Bugak Skyway and Jeong-dong. Driving there, I am always impressed that I'm living in Seoul with such beautiful places", Jang said. Jang said he will vigorously promote what he called "humane and beautiful Seoul" as the city's youngest PR Ambassador.